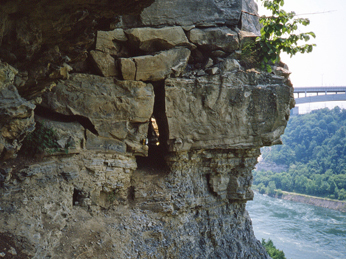 Late in the fall of 1976, while looking for Milk Cave in the Niagara River Gorge, I located several caves to the south of it. The next year while surveying the southern most cave I realized it needed a name. I decided to call it Ensminger's Cave. The cave has 3 entrances, 2 to the north and 1 to the south. The northwest entrance which is 5 feet high and 1 foot wide, is the easiest to enter. About 5 feet in from this entrance there is a side passage to the left that soon makes a turn to the left and connects with the northeast entrance after 18 feet. The main passage continues southward to the southern entrance in 10 feet. 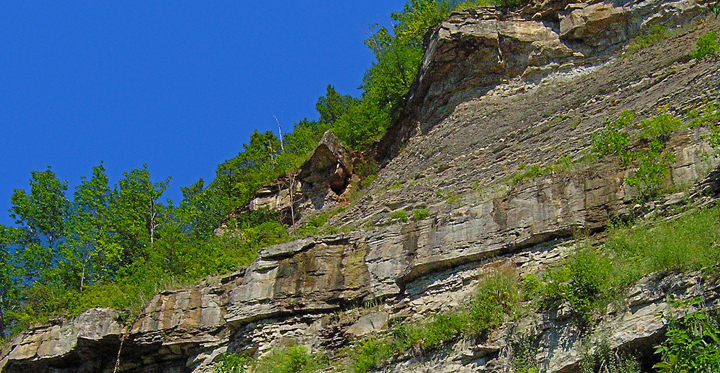 Ensminger's Cave is developed at the contact of the Rochester Shale and DeCew Dolostone. 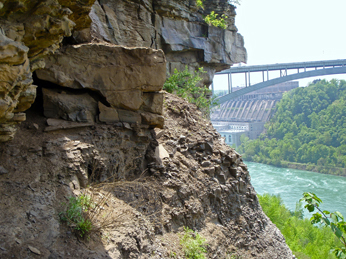 At the northwest entrance the passage has cut about 1 foot into the Rochester Shale. The passages are floored with a dry loose dirt in which a broken 3 inch long stalactite was found. The roof of the cave is extremely fractured. Click on a photo above to enlarge it. On May 29th 2011 I checked out the cave entrances from Milk to Ensminger�s. All the cave entrances south of Ensminger�s were very wet. 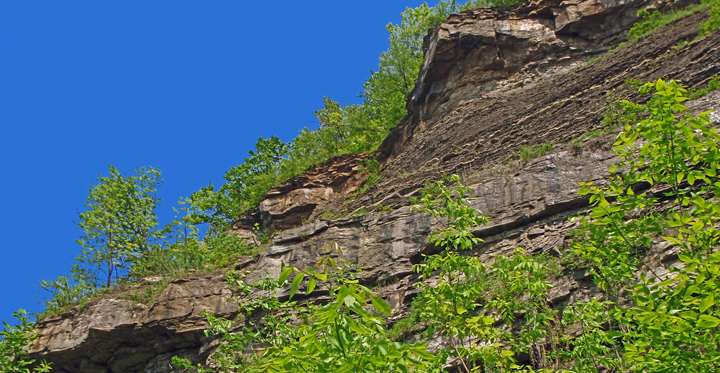 As I rounded the corner from Spring Cave I was shocked to see that most of Ensminger�s Cave had collapsed into the Niagara River Gorge. It happened sometime in the last 10 months. I checked out the fallen boulders about 150 feet below where the cave had been. I imeadtaely recognized a part of the western most entrance cave wall by its distinct solution features. By the crushed vegetation around the boulders it appears that the collapse had happened quite recently. The photo to the left was taken in 1984. The photo to the right was taken in 2011. Ensminger's Cave from below taken in 2008. The same area in 2011. In early 2017 Mark W. informed me of a natgeotv.com video that shows the roof of the cave being pushed off. This was done to make the hiking trail safer and is known as rock scaling. Copyright � 2017 by Scott A. Ensminger.